Jeff Guinn wrote a book about Bonnie and Clyde called Go Down Together. I loved it. It set what I consider the record straight. When I came across The Last Gunfight, I was pleased. It’s a well written book. I loved it. I’ve read about Wyatt Earp before, but all of the other books were dated and dry. This one is compulsively readable. It traces Earp’s life up to and after the infamous gunfight. It also covers all the major players, from Doc Holliday and Ike Clanton, to Morgan and Virgil Earp. The Tombstone period is covered in detail. 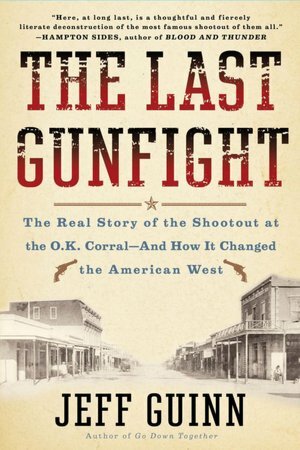 I was surprised to read that Wyatt Earp, and just about everybody else in the town at the time, were at the mercy of forces far greater than they knew. Outlaws, Apaches, politics, money, time, and nature collided. No movie could cover it all. The gunfight was a cool moment but it is really nothing when you see the big picture. Guinn paints that picture perfectly. Earp’s life, like many others in history, had both moments that needed to be written and some maybe not so much… either way both end up needing to be read about. I loved the scope of the book and I really can’t find a single thing to complain about. One of the best parts in reading it was that everything I have ever seen in a film or read in a book about Doc Holliday was right on. I’d say Dennis Quaid in the film Wyatt Earp was the most accurate portrayal. He was a poetic and deadly man who could only have existed in that period of history. You would have thought that Holliday out of everyone would have been the creation of some long-forgotten pulp writer. Not in the slightest. He was real. Westerns need to come back. This is a great place to start.